I had one of those small brazing torches you see at hardware stores that use the handheld propane and oxygen bottles. I had been thinking of using it for the basis of a rocket for a long time but I was hesitant for two reasons: I didn’t want to cut up and lose my torch, and secondly, I couldn’t find an adapter for the oxygen cylinder that wouldn’t (excessively) restrict the flow. Making one didn’t sound like it would fit my criteria. The need for a pin to depress the release valve on the tank in the adapter is what pushed it past what I think I could easily machine, also my lathe can’t make the required reverse threads. 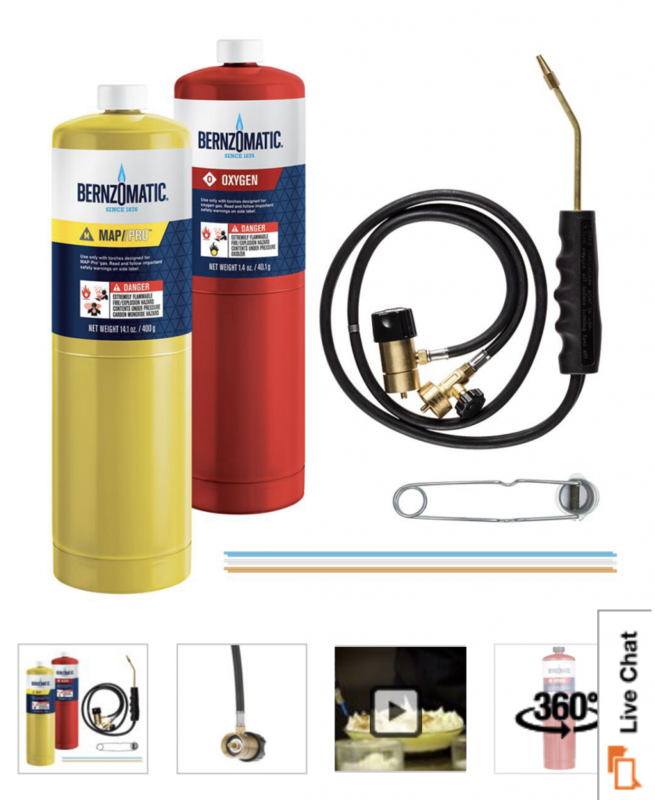 Example of a brazing torch, the Bernzomatic WK5500 available at Home Depot. Comes with a propane bottle and an oxygen bottle with a torch device to mix the fuel and oxidizer gases and discharge them through the tip. Torch is lit by the welding sparker device shown at the bottom right. After further delays with another one of my rocket projects, I was thinking about basing an engine on the torch again. I realized that if I could live with the flow restrictions I could use the valves already on the torch. I could cut the feed line tubes and put fittings on both sides. That way, I could use the tanks and valves for a rocket and still be able to put the torch back together. So, I went to work. Beginning the design, I was immediately faced with the complication that I no way to measure the flow rates of the gases. So I decided to work the math backwards from the usual way. (And will therefore omit the details so as not to give anyone else any bad ideas.) Instead of selecting the thrust and using that to determine the needed flow rate and appropriate nozzle dimensions, I started with the throat size. I had recently discovered a site that sells the same nozzles that are used in the high-powered rocket motors like AeroTech. These nozzles are made of a molded phenolic resin fiberglass composite. I picked a type that looked like it would be simpler to machine a retaining ring for, and a size that would be good for the Chromoly tubing that I had on hand that I wanted to use for the chamber. After those criteria, I was left with about three nozzle throat sizes. The nozzles were only a few dollars each so I picked a size that seemed about right knowing that it would be easy to switch it out and try different nozzle sizes if I didn’t like the results. For sizing the chamber, I used an L-star (L*) value of 75 inches. During the whole thing, I was never concerned much about performance parameters, like thrust or specific impulse. I was working with low flow rates and low pressures. The propane bottle delivered around 100 psi, but the oxygen bottle delivered only 10 psi. So I used, a regulator to reduce the propane pressure to the oxygen pressure and went with a 10 psi chamber pressure. An example of a radio-controlled (RC) model engine sized glow plug igniter shown with sealing ring. In essence, a very small version of an automobile, lawnmower or motorcycle spark plug. 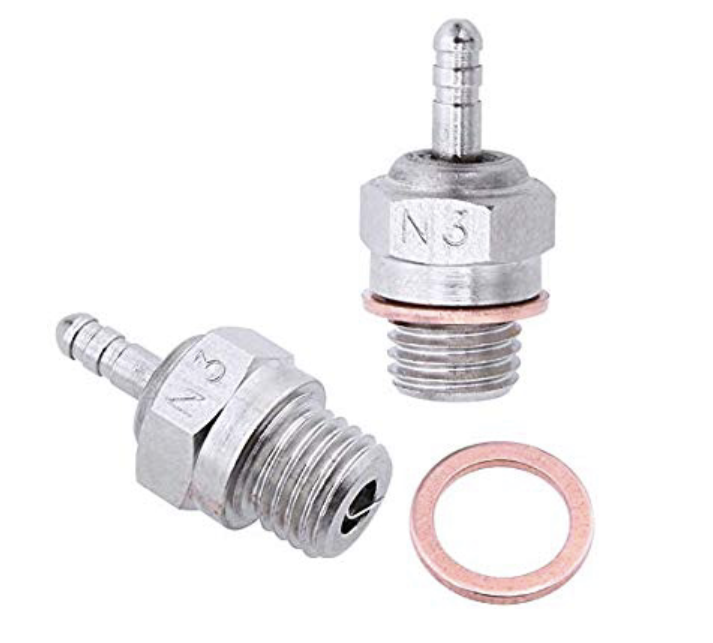 Positive electrical connector is the barbed fitting, the main body and whatever it is threaded into is the electrical ground. When supplied with electrical power, the thin platinum wire heats up. I wanted some sort of ablative liner for the combustion chamber. A phenolic resin and fiberglass composite chamber. A phenolic resin and fiberglass composite would have been my first choice. I figured that it would be a bit of overkill for this engine. I also wanted something I could get produced quickly. After taking note that PVC has been used as a fuel in some hybrid rocket engines, I thought that it would make a suitable combustion chamber liner for a rocket like this and potentially for other small rockets. After my design was finished and I was putting the finishing touches on building the rocket, I was sending information about the rocket to the RRS pyro-op in charge of the upcoming test, Jim Gross. Naturally, he wanted to know the expected thrust. Somewhat embarrassed, I hadn’t bothered to calculate it. I hadn’t given it much thought for this project since thrust and performance was beside the point. I knew that at most it would be getting a few pounds of thrust and I didn’t worry about it. So, I sat down and did the calculations. I knew it would be small but it came out to be only a gram of thrust. Well, this motor won’t be getting anything off the ground any time soon, but at least it could form the foundation of an on-board restartable ignition system for a larger rocket engine. It was also a fun practice project for a small thrust chamber design and construction. 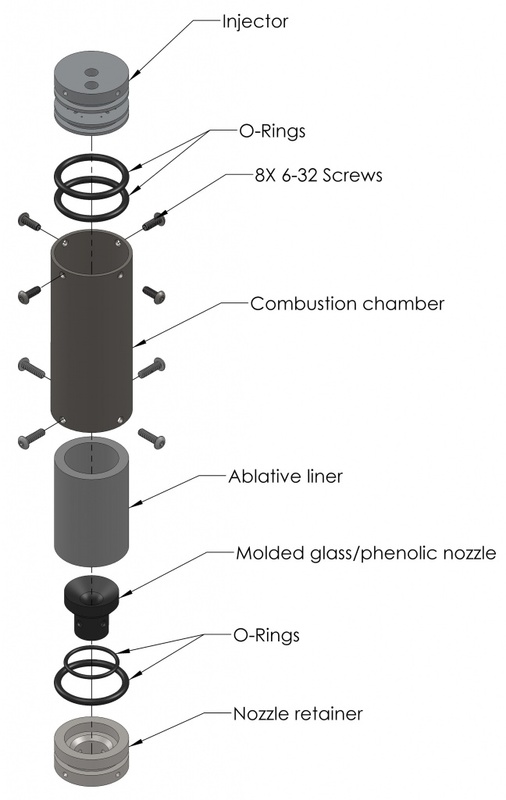 Figure 1: Exploded view of the GOX-propane rocket. The glow plug is not shown in the assembly. 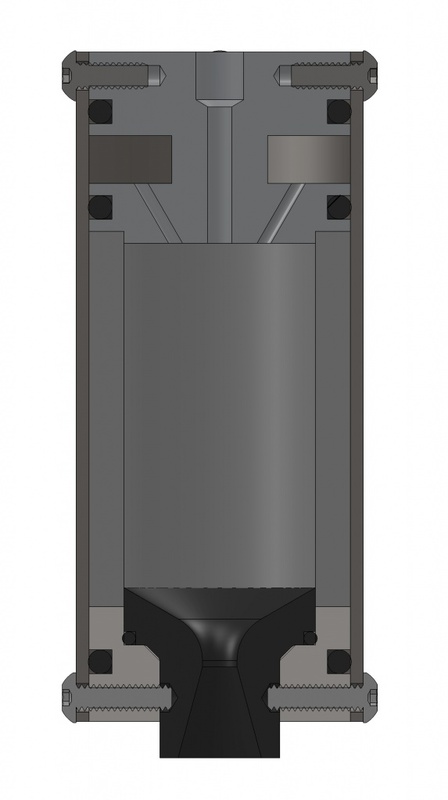 Figure 2: GOX-propane rocket cross-sectional view. Figure 1 shows an exploded view of the whole assembly except for the glow plug igniter. 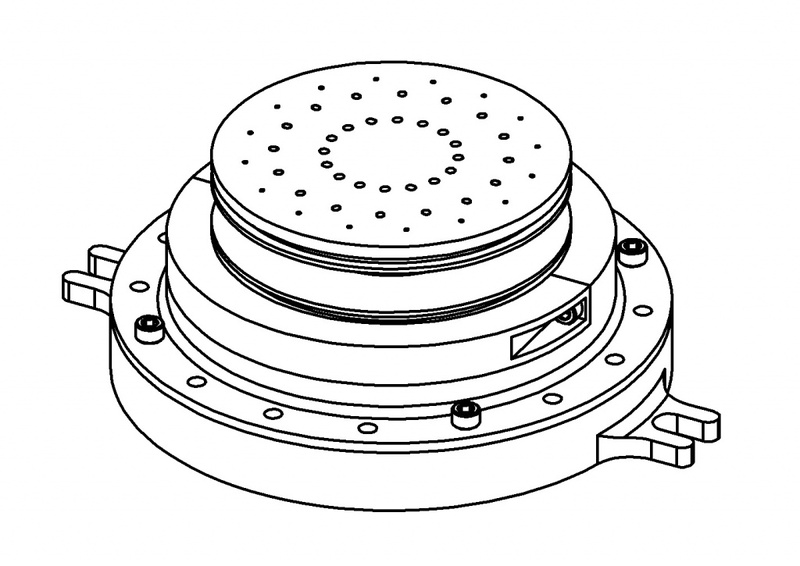 Figure 2 shows the nozzle retainer bolts setting into the nozzle. This feature would require modifying the nozzle and I omitted it from the final design. I had been concerned about pushing the nozzle into the chamber but this turned out to be only a minor inconvenience during handling. I used a solenoid valve and a check valve that I already had on hand and ordered a matching pair online. I used 1/4″ sized aluminum tubing I had and 45-degree flared fittings from the valves to the injector. I machined the injector from a piece of scrap brass I picked up back when I was in college. This was, incidentally, my first time machining brass and I was impressed with how easy it was to machine, I should have tried brass a lot sooner. Finishing the injector and making the chamber is where this project got interesting. Normally, to make the injector holes at the required angles you would have to either do some fancy work in holding your injector work-piece, like a sine vise (which I didn’t have) and rotary table or use a mill, like a bridge-port type, with a tilting head (which my mill didn’t have) and a rotary table. I didn’t have any of the right tools and I wanted something easier, something that could be done using a simple drill press. What I came up with is a fixturing system that takes advantage of the versatility of 3D printing. I had recently acquired an Ultimaker 3D plastic printer, so printing fixture parts was quicker, easier and cheaper. The basic idea is to create a slanted fixture that holds the injector at such an angle from the horizontal plane such that the injector hole being drilled is vertical. 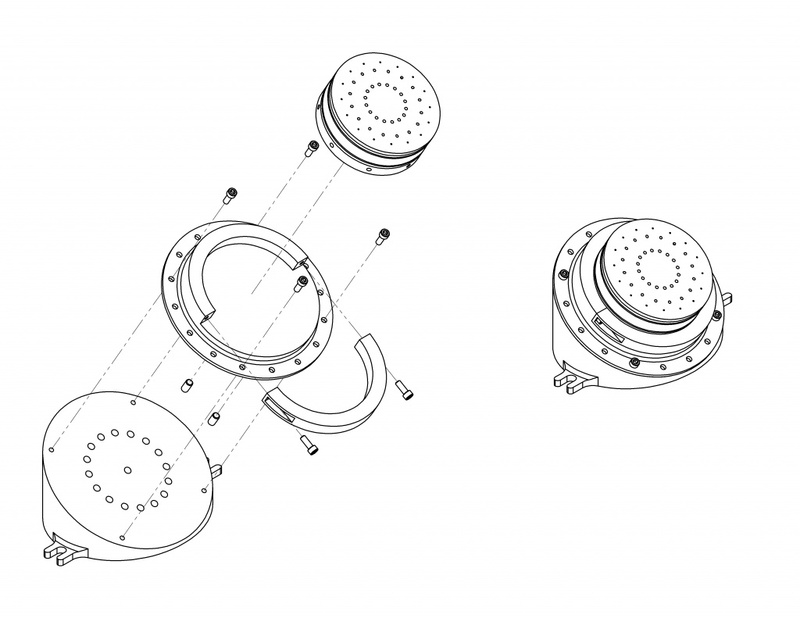 The fixture indexes from either a marked feature on the injector, or a second part of the fixture that would hold the injector and provides the rotational indexing features needed to place all of the injector holes. Such a fixture is able be able to hold the injector at several rotated positions. This removes the need other set up tooling. For multiple angles of holes in the injector multiple bases can be made. This allows the proses to be scaled up to more complicated injector designs without much additional effort. This fixturing technique is only advantageous if you can use 3D-printing. If you had to machine the fixtures it would probably be harder than using the normal methods. 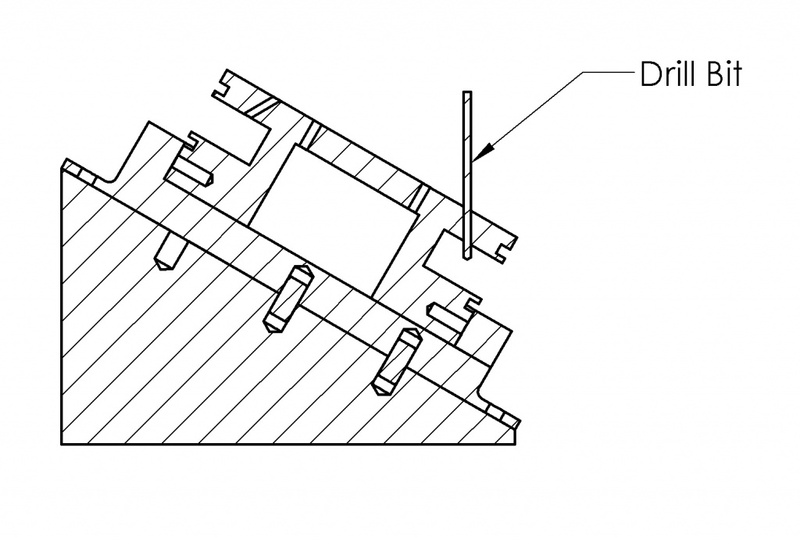 Although this method would add fixture design to the task list it should make machining go more smoothly. Making the parts with a 3D printer is easy. The real advantage however is reducing the needed machine tools. All you need in a lathe and a drill press, although it never hurts to have more tools. Potential disadvantages include reduced rigidity (unless you go through the extra expense of having them printed in metal) and reducing the obtainable accuracy, although I think the accuracy you would get would be fine for amateur projects. Figure 3 shows the 3-D printed angled fixture I made for drilling my injector. Figure 4 is a figure of a generic design for such a fixture with a generic injector taken from Scott Claflin’s larger 1670 lbf LOX/ethanol rocket engine. A possible improvement over the shown designs is to incorporate drill bushings over the top of the injector to help locate the drill and reduce wandering, which can be a big problem when drilling on slanted surfaces. Additionally, the bushings could be cut to an angle to match the angle of the injector face to eliminate the gap between the bushing and injector face. There are other ways to reduce the difficulty in drilling into the injector face. You could machine an angled face into the injector while it was being turned on the lathe so it would provide a surface perpendicular to the drill. That feature could either be left in or machined off after drilling the orifices. Also, the injector could be left with an extra thick face, and a flat area could be made with an end mill, again the feature could be left in or the face could be machined flat. Although both methods might complicate locating the orifices in the right location. Compared to the figures shown, the fixture I actually used was more crude and needed some improvements. I also used similar fixturing to drill the bolt holes on the combustion chamber, nozzle retainer and injector. This 3D-printed fixturing concept will not work for everything but it has the potential to either reduce the difficulty of complex machining operations or to expand what you can do with simpler machine tools. Unfortunately, I did not take any pictures of the actual machining process. I did the static testing on December 7, 2013 at the Reaction Research Society (RRS) Mojave Test Area (MTA). Firing day was an exciting experience. It was the first time I fired a rocket engine that I had designed. Things went pretty smoothly considering all the things that could possibly go wrong during a test firing. The firing itself also went well save for a few issues. 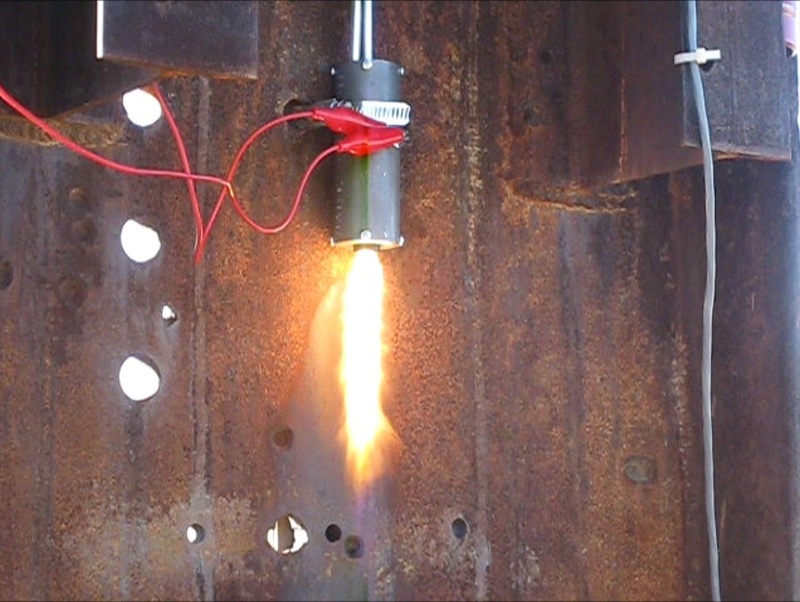 Video footage of the December 7, 2013, hot fire tests at the RRS MTA on YouTube. My test is the last one in the series. The buzzing sound that can be heard in the video was being caused by the check valves. They didn’t quite have enough flow to keep them fully open. This can also be seen effecting the exhaust flow in the video. I knew about this problem ahead of time from cold flow testing I did. On a larger rocket, this issue could be a major problem by contributing to combustion instability and all the problems that can go along with that. With such small flow rates and low chamber pressure, I knew it wouldn’t be an issue for this engine. I was more worried about any propane getting into the oxygen system because of the large pressure difference between the tanks. With the launch date approaching, I didn’t have time to seek out better check valves for such low flow, so I went forward with the valves despite the flaw. 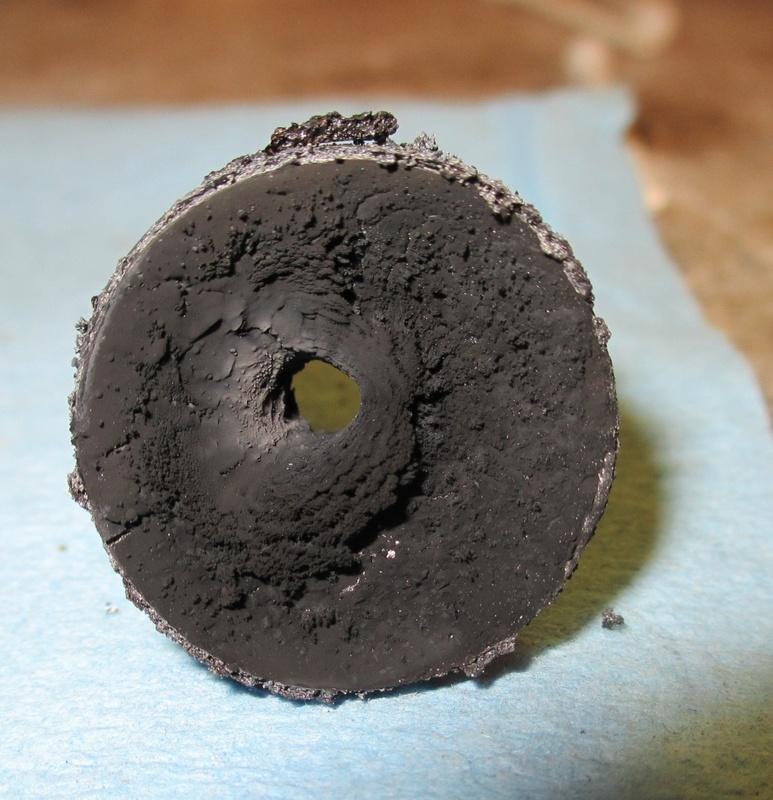 The second problem discovered during hot-firing was the significant amount of debris generated from the ablative liner partly obstructing the nozzle and canting the plume to one side. This is clearly seen in the video and progressively worsens throughout the burn. So, it turns out that the PVC material doesn’t work well under these conditions, creating too many solid particles. 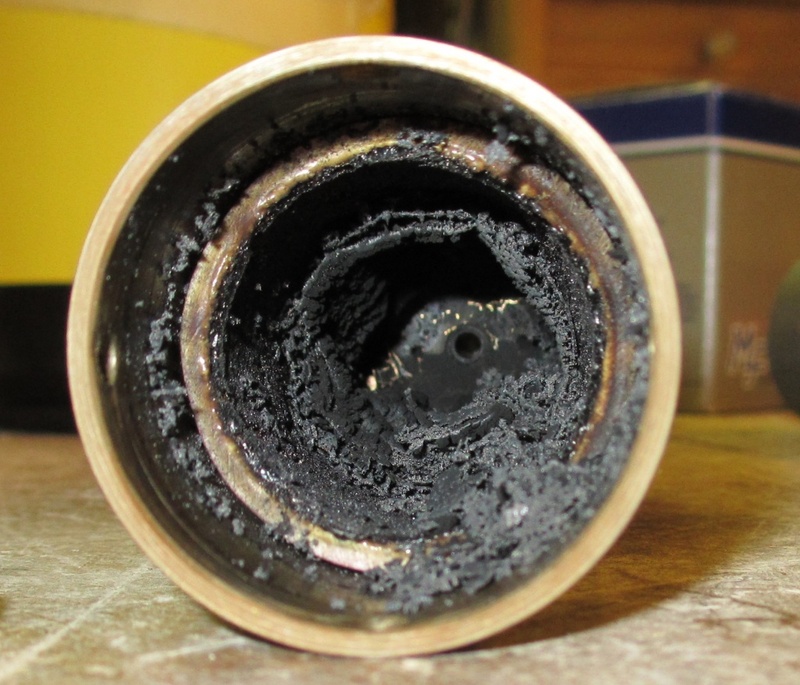 It was also evident that the PVC liner was emitting a noticeable odor. The closest thing I would compare it to is burnt electronics. The nozzle, itself, had very low ablation and looks fit to be fired a few more times once the debris was cleaned off. If I ever fire this rocket again, I will try it without the ablative liner. I don’t think it will cause a burn through so long as burn times aren’t excessively long. I also noticed that the flame color was off from typical oxygen/propane engines I’ve seen. This is likely from an atypical propellant mixture ratio probably because of actual flow rates differing from what was expected from doing the math backwards and not being able to measure the actual flow rates. The mixture ratio could be improved by either changing the injector orifice sizes or by adjusting the valves from the torch on the tanks. For this hot-fire test, I had both valves fully open. From looking at the test footage, the amount of nozzle plume expansion looks okay, but if I were to try running the engine again, I would like to try some of the other available nozzle throat sizes and see if they do any better. After running the engine, a noticeable film was left on the outside of the retainer. It has a copper and brass color. At first, I thought it was deposited from erosion of the injector. 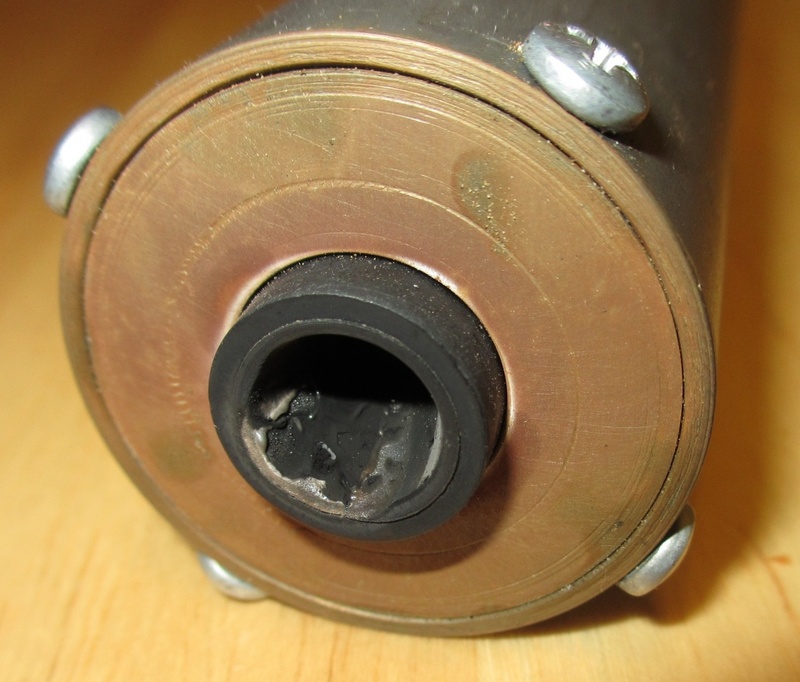 But after disassembly, the injector looked to be in excellent condition with no noticeable erosion. 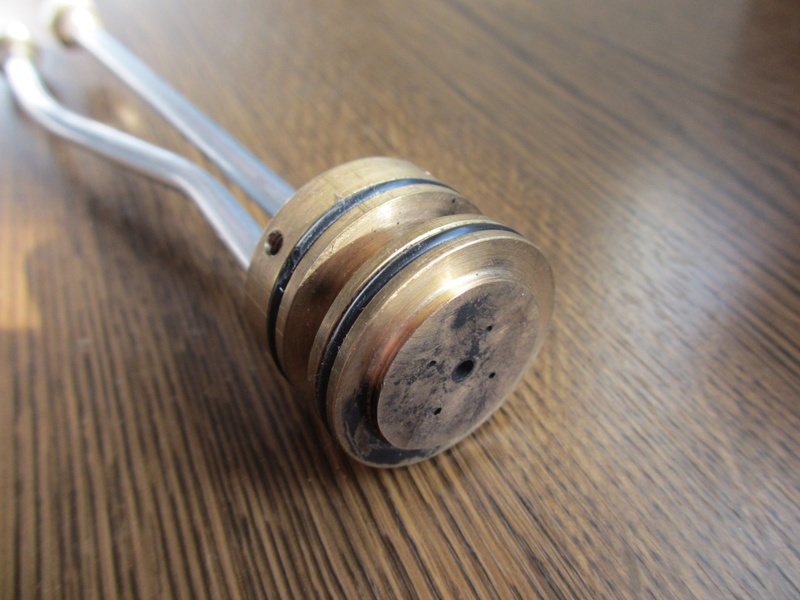 Visible in this picture is the brass coloration left on the nozzle retainer and the small but asymmetric amount of ablation of the glass-phenolic nozzle. Fire came out the right end, so it meets my criteria for a successful amateur rocket engine. If I fire the engine again, I will do so with more appropriate check valves, a different nozzle size and run it without the PVC ablative liner. The design has some potential as the baseline for an on-board, restartable ignition system for a larger LPRE, but would need to be redesigned, probably beyond recognition. But the real takeaway for the project, besides being a fun learning experience, is the fixturing method that may make building impinging injectors easier to do. I intend to try this fixturing system in future designs. 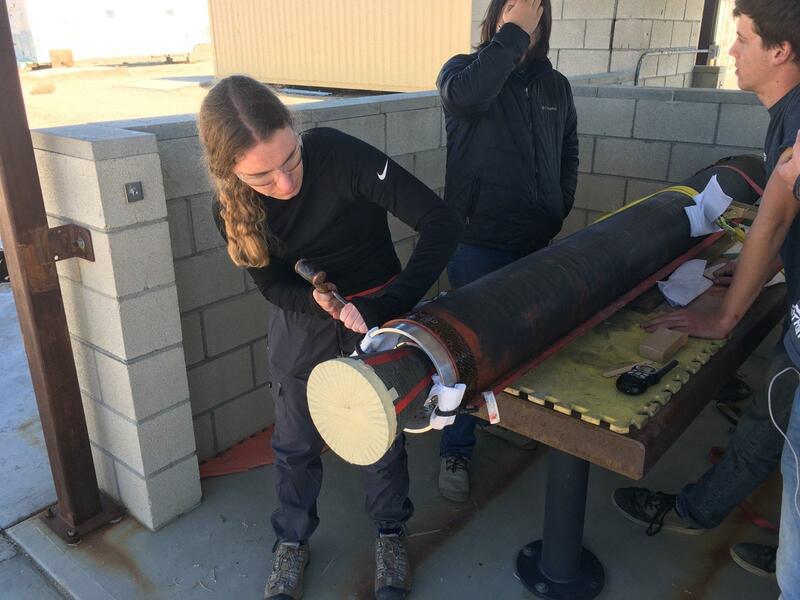 The University of Southern California (USC) Rocket Propulsion Laboratory (RPL) team led by Haley Karow had a static firing of their prototype solid rocket booster at the RRS MTA on February 17, 2018. 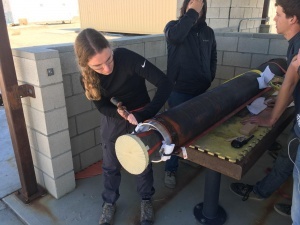 The RRS was glad to support USC on yet another advancement in their solid rocket motor program for students. (1) a newly designed carbon phenolic nozzle with graphite inserts for the converging section and throat and (2) a linen phenolic and EPDM thermal protection system for the case. The motor grains were cast in Victorville at a site owned by Exquadrum. This full-sized motor design will power the Traveler III space-shot vehicle. The nozzle looked great after the firing, but a second nozzle will be used for the flight. The motor liner also did well. 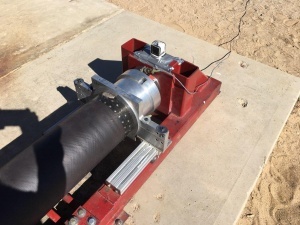 With a peak thrust of 4,864 lbf as measured by the USC horizontal thrust stand load cell, the total impulse was 41859.0 lbf-sec. Post-test inspections showed good results and the project can move forward with their flight vehicle. Ultimately, the Traveler III will attempt to reach an altitude of 400,000 feet (121.9 km) most likely from Black Rock, Nevada. 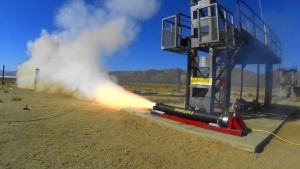 The Reaction Research Society (RRS.ORG) is a 501(c)3 educational non-profit group that supports universities, high schools and other responsible private groups with both educational programs and resources for rocket testing. Now in our 75th year as a society, we hope to expand our reach to others as we grow into a new quarter century. Contact USC RPL or the RRS for more details.